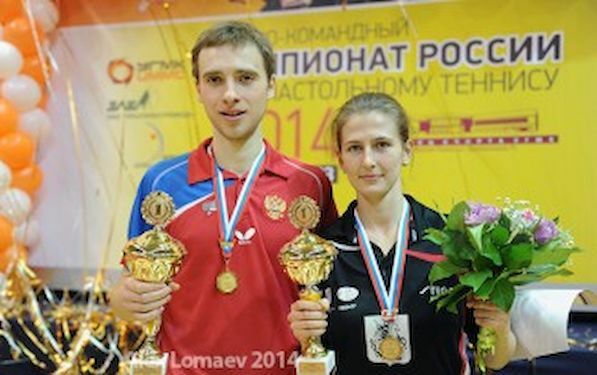 For a first time Alexander SHIBAEV (Yaroslavl) and Olga BARANOVA (Moscow) clinched the national titles in Russia. After almost a week long competition which included the Team’s Event as well Russia celebrated new champions. In the final of the Men’s Singles Event Alexander SHIBAEV overcame Alexey LIVENTSOV 4:2. Grigory VLASOV and Mihail PAIKOV clinched bronze. In the Women’s Singles Event final Olga BARANOVA overcame Polina MIKHAILOVA 4:0. Valentina SABITOVA and Eliza SHARIPOVA lost in the semi final. In Men’s Doubles Final Alexey ZHOUKOV and Ilya SHAMIN beat Grigory VLASOV and Artur GRIGOREV 3:2, whilst in Women’s Doubles Finals Anastasiya VORONOVA and Yulia PROKHOROVA (Moscow) succeeded against Anna BLAZHKO and Valentina SABITOVA (Moscow) 3:2. New champions in Mixed Doubles Event are Grigory VLASOV and Yana NOSKOVA. They overcame Viacheslav BUROV and Olga BARANOVA at the last hurdle 3:2.